Writer & Editor - Laurie Rozakis, Ph.D.
Get prepared to take the Praxis I and II and start your teaching career! McGraw-Hill's Praxis I and II offers you complete preparation for the entry-level Praxis I PPST exam, including numerous test-taking tips and strategies not available from official ETS sources. It also provides three full-length practice PPSTs based on the recently revised test format, plus sample questions for all the most popular Praxis II exams and fully updated information on state Praxis testing requirements. 3 full-length practice PPSTs based on the new test format. Preparation for Praxis I PPST: review of vocabulary, speed reading, comprehension boosters; grammar, usage and mechanics review, model essays. Preparation for Praxis II: listening skills, elementary subject assessments; principles of learning and teaching; review of mathematics, history, English, and science. Test-taking tips and strategies not available in official ETS sources. Concise, effective test content reviews. Updated information on state testing requirements. answer key with full explanations. I have to say I am overall pleased with this book. I purchased this item in preparation for my PPST Praxis I Test. I began preparing about two weeks’ prior to taking the text. 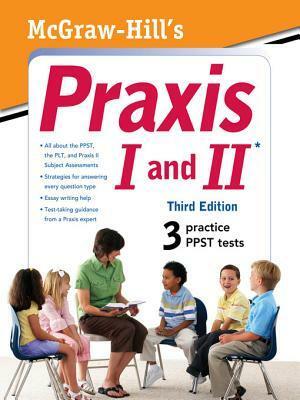 The book provided great pointers on taking the praxis test. What I valued most was the diagnostic test which was given for reading, writing and math. I felt that I had done pretty badly on two of the three. However the diagnostic tests were actually a life saver because they helped me to focus in on the areas in which I needed the most help. I passed all three parts of this test and this was the only tool I used. This book was definitely worth the purchase. I got this book because of the reviews it already had. I was looking for a book I could use to help me prepare for the praxis I and II exams. This book is a great tool to have, it gives great examples of text questions and I feel very prepared to take the exam after using this book as a study guide. There are also great test taking tips. Overall a great buy! This book is well written. The math notes are very helpful and detailed enough to prepare you for the test. The book includes practice tests for the pre professional praxis tests and specialized content tests. All the books include the answer keys which are helpful to immediately find out why something is correct or incorrect. I would recommend this book taking the praxis test. This book is a must for any level college student. I was recently shopping for a book that would give me some pointers for completing a research paper for grad school. Let me be the first to say...It is a Gem! It has become my bible. This book is very helpful in describing the research form. The samples used were also helpful in elaborating further on each topic. I found the book easy to read and gets straight to the point. The book doesn't waste your time. Though I purchased this from Amazon, I first saw this book in the campus bookstore and thought it would be useful reference for students writing research papers. 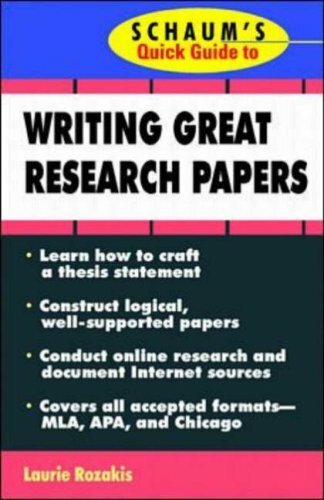 The graduate students who have used this reference for writing research papers or theses have told me it was very useful. After reading material these same students wrote before and after using this book I can attest that their writing improved (hopefully as a result of the material presented in the book). The suggestions presented by authors for organizing thoughts and constructing the paper are very helpful to those who lacked sufficient training or experience writing basic and more advanced material. I recommend this book to any student (or instructor) looking for some basic, practical information for developing a paper that is well written. This book is great. It has all the content of a dried-up grammar reference text, and NONE of the pain. Laurie is funny, direct, and great at communicating the relationship between grammatical functions and the purpose of writing. This text can be used as a regular reference to check your work, or you can read it straight through. (Let's see someone say that about Scott Foresman!) Thanks, Dr. Rozakis. Yeah, I know it sounds weird; who reads grammar books for fun? 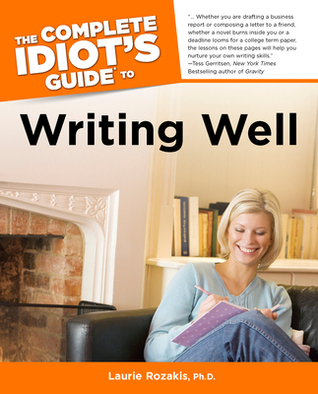 But Laurie Rozakis infuses this solid guide with her own brand of quirky humor, and it works beautifully. Wonderful quotes from famous writers add spice to the stew. Try it, you'll like it. Grammar Boring? It Ain't Necessarily So! I just loved this book! How does it manage to make learning about English grammar fun--got me, it just does. The author covers common mistakes and challenges while keeping you rolling in the aisle with her humor. The book is well organized so what you need is easy to find. 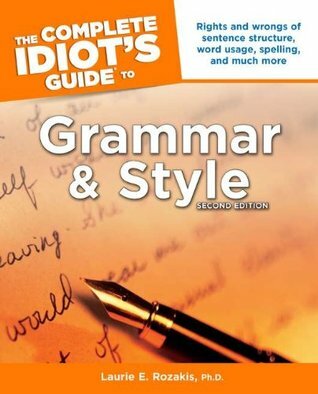 If you buy one grammar book this year (and who needs more than one grammar book?) make it this one. You'll actually read it, which is half the battle. Dr. Rozakis, one of the nation's most revered textbook authorities, has balanced the elements of grammar with a wit and joie de vivre that is rare indeed in academe. This one belongs on the shelves of students, teachers, writers, and parents. If you need to study up on English for whatever reason, this is the book. It's so easy to understand. It covers everything in the English language. It's amazing. I read the entire thing dilligently and I have to say that I've never understood proper English until now. If you want to know more about English -- your search ends here. This is the book. No other book compares. This is where the road ends! Students and teachers stand to gain a painless lesson in writing from Dr. Rozakis, one of the teaching realm's most published authors. Not only is she knowledgeable in scholarship and the real world, she displays an ebullience that infects the reader with the urge to write well. This book is one of the best writing books I owned. It was written in an easy-to-follow way that you just don't want to stop reading it. I highly recommend it to anyone who are bored by other writing books.